Pat Gaughan is a vocalist/guitarist who performs on the folk circuit either solo or as a duo with fiddler/mandolinist LJ Slavin. Her original material ranges from lyrical ballads to acoustic rock flavored songs. She plays traditional folk and blues as well as Irish songs and tunes. Pat has performed at many traditional Irish festivals and venues. Her intricate guitar work compliments her rich voice. 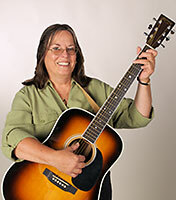 Pat's album, "Road Less Traveled," of original material has received airplay throughout the United States on public radio stations and folk programs. Recently, she was chosen to perform as part of the Great Performers of Illinois Festival. Her new album, "From Erin's Shore" of Irish songs and tunes is available at Amazon.com. She teaches guitar, American music and world music. In addition she has taught music fundamentals and music appreciation.